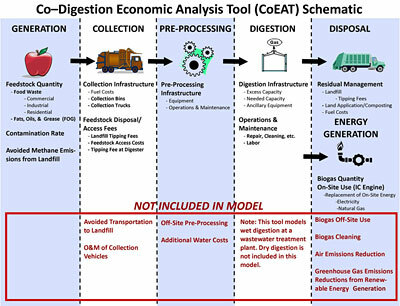 Because empirical data are not available for a wide variety of food waste co-digestion projects in the U.S., the model uses the best current data and should be considered a screening tool for initial evaluation. CoEAT does not provide a rigorous feasibility study, but does identify the various logistical, operational, and equipment considerations within an "economic cost model" resulting in the calculation of the Net Present Value (NPV) of the project. The model is flexible and users can adjust assumptions and costs to fit their circumstances. CoEAT does not provide a comprehensive lifecycle assessment of environmental impacts. The model does provide solid waste diversion potential, methane emissions reduction from landfills, and biogas production potential. Wherever available, source data is provided for further research and evaluation. For the best results, users should input community-specific information instead of using model assumptions. CoEAT is designed for decision-makers with significant technical experience, including municipal managers, engineers, and wastewater treatment plant managers. CoEAT is available as a Microsoft Excel Spreadsheet. For instructions on how to use to tool, see the CoEAT User’s Guide. 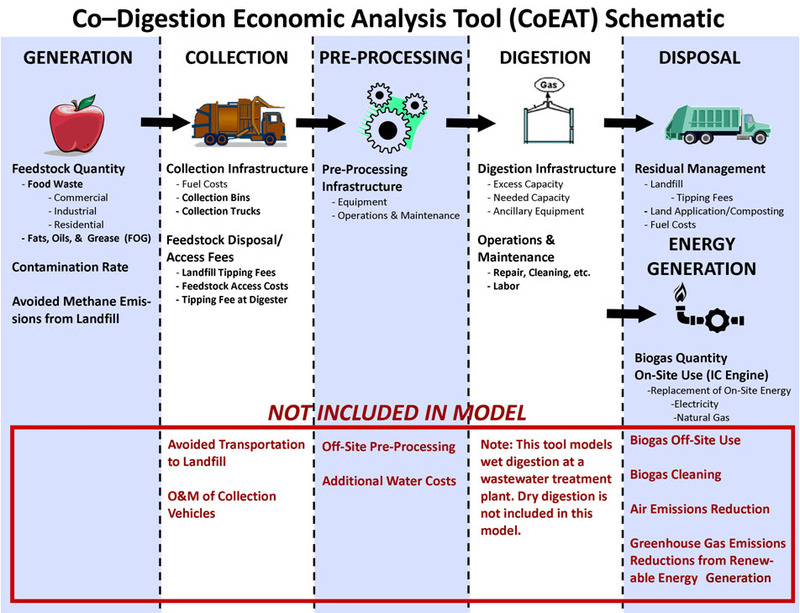 CoEAT does not require pre-existing WWTP digesters, and will calculate results with no pre-existing digester in place, however the model was intended to help WWTP operators assess the viability of implementing food waste co-digestion with existing anaerobic digesters. By diverting organic materials, communities can reduce the methane emissions associated with landfills, the second largest anthropogenic source of methane in the United States. By diverting organic materials from landfills, “waste” can become a renewable resource, like energy, a soil amendment, or both! Food waste accounts for 18% of waste currently reaching landfills in the United States. Food waste has three times the methane production potential of biosolids. If 50% of the food waste generated each year in the U.S. was anaerobically digested, enough electricity would be generated to power over 2.5 million homes for a year.